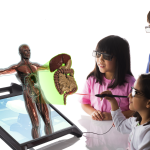 Google's innovative visual technology will have many applications for teaching and learning. Google recently announced winners of its Google Glass contest, most of which were celebrities and famous Twitter users. The technology is poised to go main stream once it’s released to the masses. Among all the possible consumers of Google Glass, the device has the potential to bring exciting new possibilities to teachers and and students alike (not unlike how the iPad ignited the use of tablets in academic uses). The Glass can be used for a variety of purposes which don’t require any taps or navigation, responding instead to voice commands. It can be used to record videos, share content, take images, and detect objects in front of you and look up related information like directions or maps. The glasses will allow the user to stay connected to an interactive environment featuring online tools all the time. There was a lot of interest among students after the Glass was unveiled last year. Old Dominion University’s Mace & Crown student newspaper called the spectacles ‘a leap into the future’. Stephenie Brown from Acadia University expressed interest in this blog post in which she sees the spectacles being used in creative ways. One of the major features of Google Glass is to present text based translations in real time. This would be helpful in language learning courses as students would have the benefit of real time decoding of languages. Students of different cultures would be able to help each other in learning new languages. 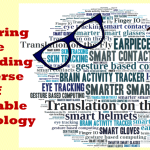 The process of translation would be improved as Google Glass gets perfected with time after its introduction. Google Glass has the ability to shoot quick videos and images. This would be helpful for students when they’re preparing some types of presentations or documenting research as they can capture visual content with speed and ease. Fast-paced recording and shooting can enhance both creativity and productivity. With Google Glass, students will have a web browser available in the air at all times, and they can use it for searching information, making notes out of it, bookmarking important pages for later use and much more. New apps for the Glass would allow students to make use of social media channels and other resources such as Dropbox and e-mail to save and share their research with little or no hassle. It’s important for students to build their portfolios during their academic tenure as they prepare to seek and land jobs, and portfolios can even help to secure start-up capital. The features of Google Glasses will help them to add extra spark to their portfolios. The ease of capturing visual content can be used by students to add real-life elements to their portfolios, including feedback from people they interact with while demonstrating their work. It is a pretty safe assumption that Google Glass will lead to new applications and technology innovations, that much like with the exploding tablet app market since Apple introduced the iPod, can result in new career possibilities, which means new instructional training needs. As smartphone app development became a fast growing, well paid career in recent years, the need to create and offer related training in development tools grew quickly as well, and Google Glass and spin-off technologies hold a similar potential. While the price will be out of the range of most students and teachers initially, as the market embraces this technology, prices will come down. Like other new technologies, it will likely take a while for educators and students to adapt to Google Glass and reap its benefits inside and outside of the classroom, but the potential is already exciting. Mellisa Burke is the marketing and content manager for International Reviews (www.interviews.com). She finds motivation by making new connections in her industry. Great article. The application of Google glass can be great however, only time will tell how effective it would be.